We don’t just build corporate websites at Union Room. Our talented designers can turn their hand to just about anything and we’re more than happy to work to any brief. 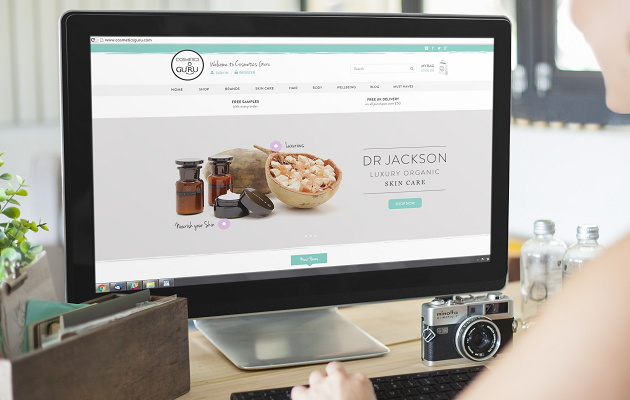 One recent project that highlights this is ecommerce site Cosmetics Guru. A far cry from Pearson Engineering‘s armoured vehicles and Johnston‘s tractors, Cosmetics Guru are a new start-up selling premium beauty products for those looking for a bit of posh pampering. Based in London, Cosmetics Guru came to us with a logo and brand identity already in place and were looking for an ecommerce website that was a little fluffier round the edges than the projects we normally find ourselves working on. They needed a design that would ensure the website marketed their high-end products in the best way, and functionality for purchasing and providing a platform for beauty tips, reviews and integrated social media feeds. The website would be launching with a number of products initially but Cosmetics Guru have big plans for expansion and needed a site that could grow with them and be able to incorporate new brands as they came aboard. We worked with the existing colour schemes and designed the site, complete with banner imagery, in a way that would best promote the brands Cosmetic Guru stock. This involved keeping the target audience in mind at all times. Success will be heavily dependant on user experience so we had to make sure this principle was at the forefront of the project plans. To read about the project brief and our solution in more detail, check out the case study. If you’d like to challenge us to something a little different, and maybe let our team get in touch with their feminine sides, then drop us a line.